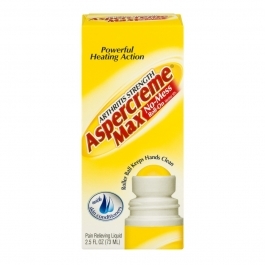 Aspercreme Max No-Mess Roll On Powerful Heating Action Arthritis Strength with skin conditioners provides powerful heating action. Adults And children over 12 years: apply generously to affected area, massage into painful area until thoroughly absorbed into skin, repeat as necessary, but no more than 3 to 4 times daily, if medicine comes in contact with hands, wash with soap And water. Children 12 years or younger: ask doctor. Crop cap tightly after use. Keep carton as it contains important information.